Company brands and logos can be installed permanently with ecoFinish aquaFX stencils for complete customized pools and spas. Residential clients don't have to live with cookie cutter pools any longer! Designer Patterns. Company Logos & Brands. Statement Pools. aquaFX™ stencils enable our Certified ecoFinish Installers to offer residential and commercial clients the latest in custom finish detailing. Stencil fabric is applied to the final finish coat of aquaBRIGHT or polyFIBRO finishes then a contrasting colour is applied through the stencil pattern; this combined finish layer becomes one permanent single layer. The stencilled pool has the same properties and tested results as our standard aquaBRIGHT™ and polyFIBRO™ finishes-permanent and hard wearing. aquaFX Stencils Provide Customized Designer Options. Forget cookie cutter. We can customize your pool and spa to fit your look with unique patterns and a variety of colours. 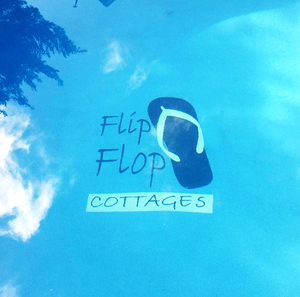 Company logos can be used for campgrounds, hotels, motels and resorts. Residential clients looking for a feature with their favourite sports team logo also available. Stencils offer a permanent smooth alternative to traditional paint markers. Yes, we can match a color chip or an RAL Color number and produce a custom aquatic finish color unique to you. Contact us today for more information. Leave your mark!